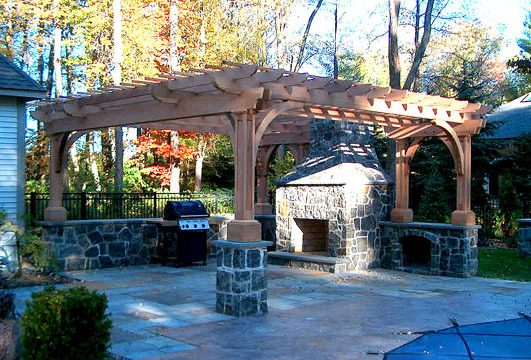 Placed upon a stonewall and atop plinth bases, this detailed pergola was designed to frame a beautiful fireplace. Gothic style arches were incorporated to stabilize the structure and to fit handsomely within the space on either side of the fireplace. This is an example of a structure that has been designed to work within a very defined area. The plinth bases conceal stainless brackets used to attach and stabilize the structure.